The Ace filmmaker, Mani Ratnam revisits his fascination for the Gangster genre. Nayagan remains a cult classic after decades but his recent creation Nawab 2018 , remains unaffected by the mind that made Nayagan, for it does not offer anything remotely subtle to mellowdown this chaotic, high-octane Gangster drama. Labelling this film as a Gangster drama would not be appropriate as the film is primarily fueled by the shameless fued among the beastly family members, at the center of which, are three brothers, trying hard to curb their, otherwise, evident hunger for power. The three brothers are played by Arvind Swamy, Arun and Simbu and Prakash Raj plays their father, the man in Power, an aging gangster. The first 20 minutes of the Nawab 2018 sets up the characters with some energetic tracks by Rahman. The brothers come home after their parents end up in a hospital due to a murder attempt on them. The rest of the first half, works mostly as a whodoneit drama, with some interesting family dynamics powering the screenplay. Going any further into the plot would give out spoilers, having said that there is not much suspense built through this convoluted script. For most part, we are shown that the story is about which one of the brothers attacked their father but the film, interestingly, drops this idea and changes the direction of the story, resulting in a reveal at the end that does not come as a shocker but thanks to a superb performance by a certain actor who elevates the scene, it is satisfying. This is the singular aspect that powers an otherwise generic film, performances. It is, perhaps, the most exciting ensemble. Arvind Swamy, Simbu, Arun Vijay playing the brothers, their parents by Prakash Raj and Jayasudha and a family friend, Vijay Setupathi plays a suspended cop. There are women in the film, only to die or go to jail. It is a pity that with a maker like Mani Ratnam we don’t get better written Women characters. Terrific actors like Jyotika, Aishwarya Rajesh and Aditi Rao Hydari are wasted and reduced to victims of this blood-soaked narrative. We get one delightful scene between the wife ( Jyotika ) and mistress ( Aditi Rao Hydari ) of Arvind Swamy’s character Varada. Mani Ratnam shuns all the art in his style and tries to make a solid, entertaining action film, where each character is introduced with a slo-mo, using a jerky camera, quite generic frames without the usual artifice. The first half gallops along with great dynamism but the later half of the film, where you expect things to get lip-smackingly interesting, its almost like the jockey, forcefully, holds back the galloping horse. The reason for this sudden shift of tone is the incoherent script, the family dynamics which are enjoyable in the first half, are hindered by some convoluted writing as the script is never sure about who wants what and from whom. The characters of the brothers are out of depth and it becomes strenuous to keep up with the story as the characters have given up on the audience, the direction alone cannot keep you invested in a film that is written badly. A R Rahman once again produces an album that is unique. It is surprising how this man keeps reinventing himself time and again. The secret lies in the fact that he never treats an album as a separate entity. It is never to pull the crowd in or to make money from the music rights. With Nawab, he produces an album that is melodic and melancholic. The use of music in every Mani Ratnam film is exemplary. It adds an invigorating dimension to the storytelling. 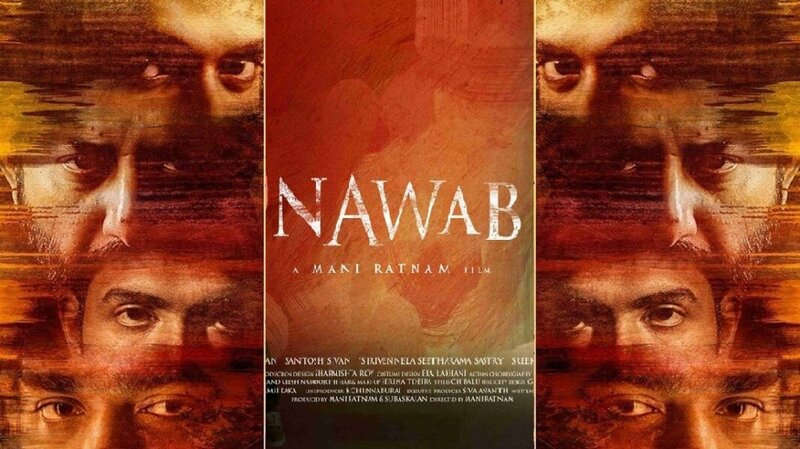 In Nawab, the music suffers because of the way it is used. At most portions the use of music is jarring and also contributes in the uneasy tonal shift of the story, it just does not flow with the narrative. The scenes with music feel like a badly cut music video. Its a pity that an album so rich is not used to its best. This happens because every Ratnam film, uses music as a parallel narrative but here, because the narrative is cluttered, so is the music. The extremely skillful Director in Mani Ratnam saves the day by helping out the disappointing writer in him. I have not seen an Indian director stage scenes better than him. There are two such reassuring scenes, about Ratnam’s skill. There are three subjects in the scene. Subject 1 : One brother, removing the bandage on his mother’s head ( both facing a mirror ). Subject 2 : Two other brothers accusing each other for the attack on their father. These dirty accusations, tearup the hurting mother and we see a shot of a tear rolling down her face, while the brothers are arguing in the background. In comes subject 3 : The father, Prakash Raj comes into the scene and stands in between the other two subjects, reassuring ( visually ) that he is still the one holding these two ends together. There is a scene at a crucial point in the film when the three brothers are in a vehicle ( which is a recurring trop ) and Vijay Setupathi is driving the vehicle. They reach a point on a hilly terrain where there’s no road ahead and one of the brother orders him to keep driving. Setupathi, as he can’t go forward, keeps the driving the vehicle in circles. This is symbolic of the fire engulfing the one who started it. It is this fascinating element of Mani Ratnam’s direction that keeps him relevant after several decades. It is time he conjures a script that can match his directional brilliance. Nawab 2018 is an entertaining action film with some powerhouse performances but eventually, it remains a well made film with shallow writing. Manto Movie (2018) Review | A well-crafted film that is sporadically eluded by its soul.